I get to make up (some of) the rules. Edward Stratemeyer's Under Dewey at Manila, part of the Old Glory series and one of the few books Stratemeyer wrote under his own name. Also, the newest addition to my personal collection, at $3.50. Not all the rules are free for interpretation. The ones that aren’t are mostly dictated by market forces – scarce books are worth more than common ones, books in good condition are worth more than beat-up ones, and so on. But the beauty of scouting books, especially for your own collection, is that you really can do it on any budget and at any price point. I make approximately $30,000 per year as a freelance writer, and I pay hefty medical bills – yet I can also support my book-collecting habit easily on less than $50.00 per month. 1. If I spend more than $30.00 in any one shop, I’m doing it wrong. 2. I shall never pay more than $1.00 for a paperback or $2.00 for a hardcover unless I am absolutely certain the book will sell for at least three times (3x) the asking price, or it’s a fair market price for a book I plan to add to my personal collection. 3. If it’s not a first edition, I can’t afford it. Not even if it’s free. 4. I may only buy as many books as I am physically able to carry to the register in one trip. 5. I will let go of my mistakes. I search for collectible books mostly at thrift stores, some secondhand/consignment shops, and the cheaper antiques malls in the area – where the sellers are mostly just looking for a way to get rid of the overflow from their own collections and realize that the pool of shoppers is low on both expertise and cash. This keeps the prices low, which keeps me from going over my slender budget – and, if I’m sticking to my other rules, the chances of my going over $30.00 in any one place are vanishingly slim. I will, however, break this rule for reference materials or for additions to my own collection that are fairly priced. For instance, my last trip to a local antiques mall netted me three illustrated guides to collectible children’s books at $9.00 apiece – well over budget with my other purchases, but worth it, as they’ve already paid for themselves (see At Manila With Dewey in the picture above). 2. I shall never pay more than $1.00 for a paperback or $2.00 for a hardcover unless I am absolutely certain the book will sell for at least three times (3x) the asking price, or the it’s a fair market price for a book I plan to add to my personal collection. a. Never buy paperbacks without being absolutely certain the first edition was released in paperback, or the books are proofs or advanced reader copies (ARC)s.
b. That’s “sell to a dealer for at least three times the asking price,” not “ultimately sell to a collector for at least three times the asking price,” unless I have a particular collector in mind whom I know will pay that much for a particular book. 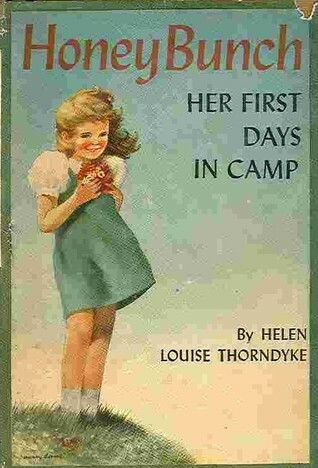 Honey Bunch: Her First Days at Camp, in a dust jacket that's not original, but that is much better than the ones I didn't buy. But it has kept me from making some impressive mistakes in the past, like the time I nearly bought a half-dozen dust-jacket-less books from the Honey Bunch series for $10.00 each, but didn’t because I simply didn’t know where or to whom I could sell those. In retrospect, I could sell a few Honey Bunches to the right collector for $30.00 a pop – but not without their dust jackets. Corollaries (a) and (b) are strictly business matters. If you’re only searching for additions to your own collection, you may be able to skip them. I’ll explain below. In at least one of the bibles of the book business (possibly by Allen and Patricia Ahearn? ), the authors explain that the reason they buy first editions is because they can’t afford to buy anything else. As counterintuitive as that sounds, it makes a lot of sense if you’re hoping that most or all of your books will increase in value. In short, pretty much everything – especially anything printed in the last century – is only valuable to collectors if it’s a first edition. I can resell most first-edition novels for enough to make it worth going out and finding them in the first place. When I find a book I want to keep (which always happens, first editions are the only things I can reasonably expect to increase in value over time (assuming I keep them in good condition). Non-first editions? Will almost certainly be worthless, even if I keep them indefinitely. That said, there are some modern firsts that were printed in such overwhelming numbers that I can’t even move a first edition at any price. The current bane of my existence is a Fine first edition of Mitch Albom’s The Five People You Meet in Heaven that I can’t even give away. I’ll try again in fifty years. Non-first editions are a losing prospect. In fact, they’re such a losing prospect that I won’t even take them for free, unless I know they’ll sell despite being non-firsts. Because most people won’t pay for non-first editions, I end up having to give them to friends or post them on Paperback Swap. Don’t get me wrong, I love both gifting and Paperback Swap to death – but by the time I’ve paid for shipping supplies, postage, and the gas to drive to the post office, I’m $5.00 or more in the hole, even if I paid nothing for the book. For me, it’s just cheaper to rule non-firsts out-of-bounds in the first place. This rule doesn’t actually have anything to do with profitable book scouting. Mostly, it helps me cut costs by editing my picks before I plunk down cash for them. It also prevents me from having to push a cart around the store, which saves me money. I’m a thrift fashionista as well as a book collector: to me, putting a cart in my hands is like double-dog daring me to fill it. Every book scout, bookseller, and book collector makes mistakes, especially in the beginning. I’ve made several, the crowning glory of which was the time I passed up a Fine first edition, in an equally-Fine dust jacket, of Jerzy Kosinski’s Steps. What was I thinking?! 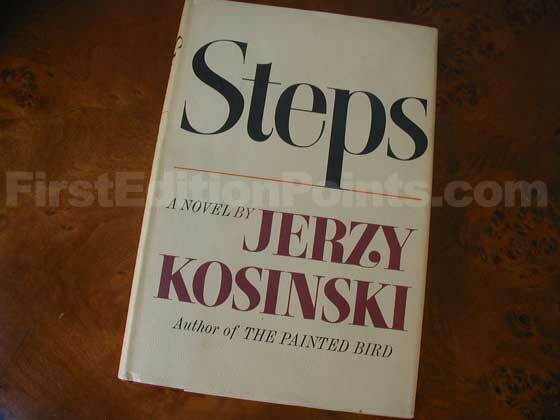 The front cover of the first edition, first printing of Jerzy Kosinski's Steps, courtesy of the National Book Award First Edition Collecting Guide; click to visit. Total I’d have paid if I’d bought this book: $3.00, which is less than its original 1968 sale price of $4.50 (even before inflation). Value of this book: more than $3.00. A lot more. I still kick myself when I think of my various gaffes, but there are other books in the world. Other copies of Steps, even. I just hope the one I passed up went to someone who likes Jerzy Kosinski’s work at lot more than I do. very nice tips you got here. I have always wanted to start my little book collector’s shop. Now, i have learned to always look for the First Edition print when I hop into bookstores. =D thanks really. Excellent advice for someone like myself who has been collecting books for the past 5 minutes. For me it started with some first edition Star Wars novels and a first edition Star Trek – regardless of whether they are worth anything, I was thrilled with the finds. Your personal rules are now my personal rules. Thanks! I am the beginning collector of books. Thank you for your tips, I think they will help me on me on my way. I have one question about collection, though. Are “uncopyedited” editions of books valuable?